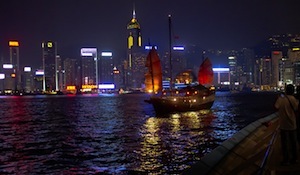 A fantastic sound and light show occurs every night in the Hong Kong Harbour. Laser beams shoot from office towers and music is perfectly synchronized. I had camera in hand to record this superb event when a magnificent tourist junk came sailing by. If you would like to purchase this photo for your publication, please click here to contact the author directly.